Breathe new life back into your carpets. behind a sticky residue. And the rental machine itself is a one-pass treatment that doesn’t pre-treat spots or rinse with clean water afterward. Homeowners are left with over-wet carpets and detergent residue. 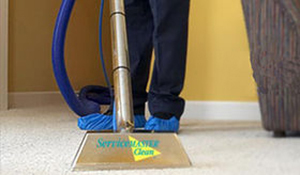 ServiceMaster Clean follows a thorough, five-step cleaning process to ensure both dirt and detergent are cleaned from your carpets using high-powered, truck-mounted equipment. WHAT TO EXPECT: What to expect with our service.